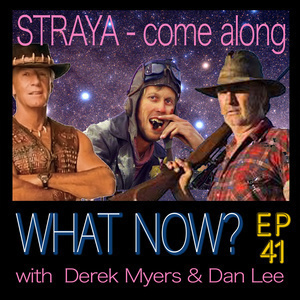 Funded By Oz Tourism | What Now Derek? 41 Dan is getting no sleep with the new baby and all, so episode notes are done my way... a list. In one hour we cover....Yakandanda parma, Wake in fright, Crocodile Dundee Vs Wolf Creek, D.H. Lawrence "Australians are like their country.. a fair periphery with a dead centre". Will Hanigan the pearl Dundee Dating Demi Moore. Alby Mangels world safari. Hay-fever Noobs amuse Derek as they turn into sooky Dr Smith. The Baby Whisperer or Mrs Doubtfire with chloroform up her sleeve? Mortgage talk... zzzzz. pure boring evil corporate vampires. Derek takes Dan's Vampire metaphor into ridiculous levels of dairy farmed human blood banks. Also why would a corporation or local government begrudge a small payrise if it means losing half of their productivity? Dan once worked moving office furniture around and around the same building... I suspect candid camera. Derek retells his Dad's old Navy Stories. Old Tom built the engines for the last working British steamship. "They all look the same to me" unpicked. Local Toughy punched two dudes at once just to see if he could. Eastern suburbs railway stations of the 1980's Setting Goals and achieving them, one trolley of beer at a time. We remember a mutual mate, former death metal singer Dave Dread, who has been on a fascinating journey to happiness. Too much for one day. Vegan stage spitting and fake talkback callers. Phew.